To treat spinal chord injury, Mark Tuszynski, MD, PhD, and his colleagues at UCSD and VA San Diego Healthcare embedded neural stem cells in severed mouse spinal chords. 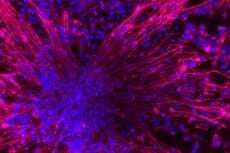 The stem cells were mixed in a fibrin matrix to form a gel before implantation. Within six weeks, the mice recovered partial mobility, and examination of the injury site revealed high axonal growth and signal conductivity. Even when stem cells derived from different sources were transplanted, the same improvements were found. Their study, published in Cell, may direct future treatments for severe spinal chord injury.